We first saw the Mark S back at Computex, where it had the development name ‘Sabranco’ (that’s Sabertooth mixed with ‘branco’, the Portuguese for white). At the time a few media at the event remarked that the name did not roll off the tongue, and instead ASUS has called it the Mark S. At the time we mentioned that the color scheme was ambitious, but it transpired that the design was very well received by a lot of readers in the ROG forums and elsewhere with Computex coverage. 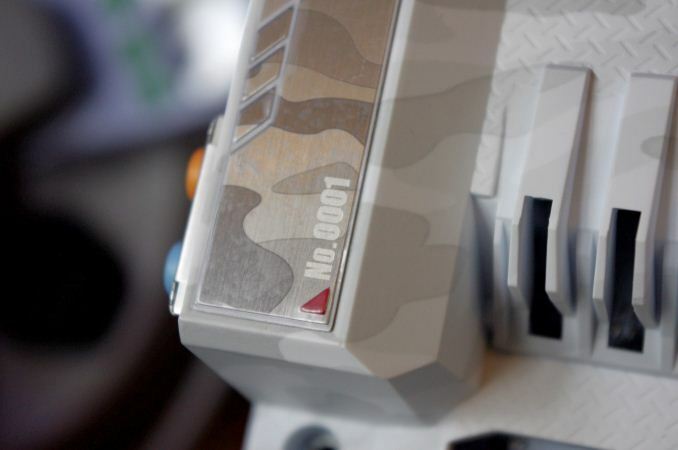 The Mark S, in its base explanation, uses a motherboard color scheme to benefit the arctic camouflage TUF Thermal Armor. 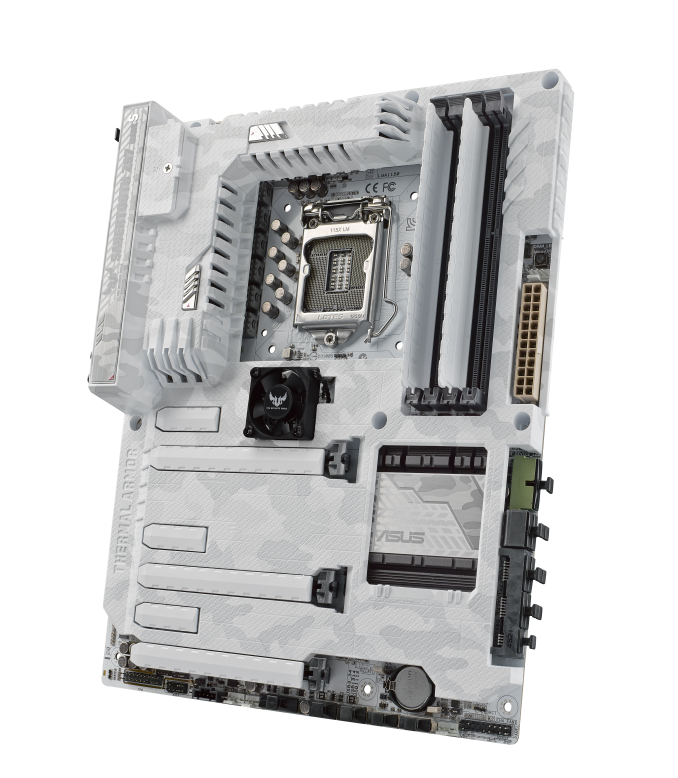 This means a white PCB, appropriately colored heatsinks and port connectors, and a set of accents on the overall theme. The Z97 Mark S will be a limited edition model with each motherboard labelled with a four digit number to signify where was in the production line. We were lucky enough to source the genesis model, #0001, which we will send back to ASUS after the review where they might give it away in a contest or use it for a presentation build. I tried my best not to break it! 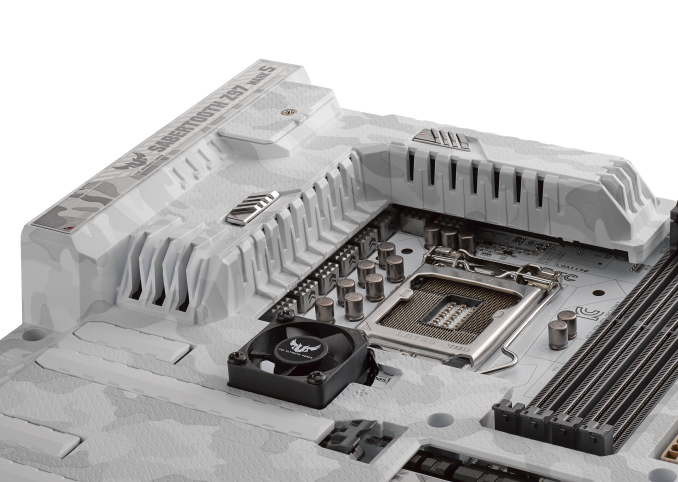 In the package of the motherboard are a series of slot and port protectors, along with additional small fans for the center of the board and the rear panel. ASUS’ TUF range comes with a five-year warranty compared to the standard three-year. 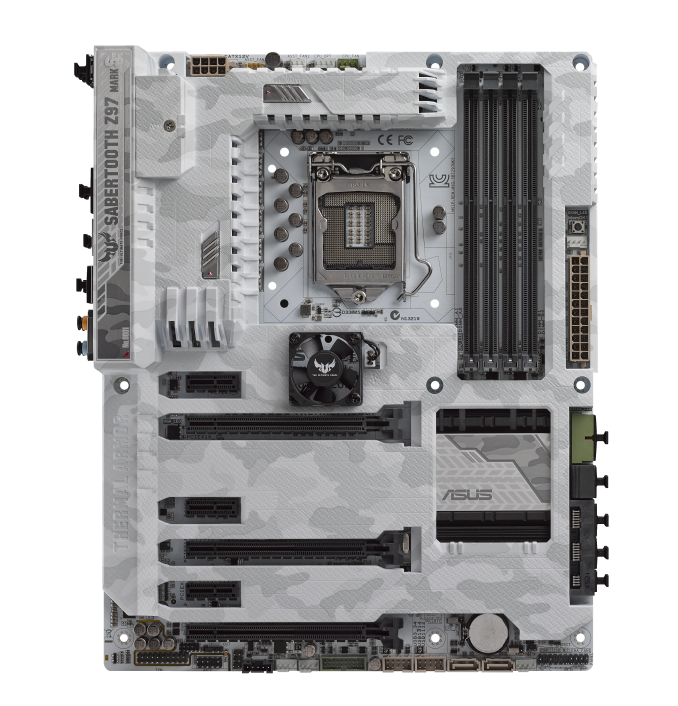 In terms of feature set, the Mark S follows the Mark 1 – six SATA ports from the PCH with two from an ASMedia controller, four USB 3.0 ports on the rear with another four via an onboard header, x8/x8 PCIe layout for dual GPU setups, Realtek ALC1150 audio with PCB separation and a dual network setup via an Intel I218-V and Realtek 8111GR NIC. The BIOS gets a slight tint change indicative of the Mark S, with the grey background given a white accent. The software is the package from the TUF range, featuring Thermal Radar and adjustable fan control that allows the user to specify a temperature range based on several of the dozen sensors on board. The Mark S performs well in our benchmarks, with some of the system benchmarks being top tier. It scores the best ever result we have had with DPC Latency at 29 microseconds, along with a strong audio performance and sub-11 second POST times. The Mark S will retail and a slight premium above the Mark 1, which is currently $260. 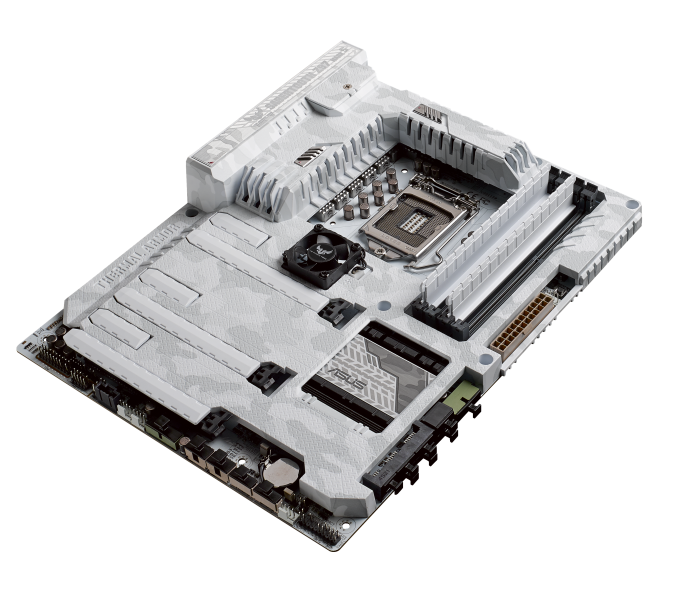 As of yet ASUS has not decided how many of these motherboards they will make, but pair it up with similarly styled DRAM, a chassis and CPU cooler and it will look mightily impressive. It is easy to get carried away with the looks of the board, but from a pragmatic standpoint it is still a TUF / 5-year product. Although the range of extra controllers is not totally impressive (one could argue there is space for a WiFi card on the rear panel or an M.2 between the PCIe slots) for the price point, the styling and package go well together and the component choice for longevity is important to keep in mind. Out of the box our motherboard came with the Thermal Armor attached although none of the slot or port protectors were in place, neither were the two small fans. Users will have to add these as their planned build dictates, but none of them are absolutely necessary. I know some users are not fond of the smaller sized fans and ASUS makes them not compulsory for the warranty, although they do have full control of the RPM in software to keep them in a low power and silent mode. Most of the motherboards we get in to review have their PCB exposed, although the use of Thermal Armor here does not distract from some of the core elements we can examine. The socket area is open, although due to the use of directed air baffles it can be difficult to attach large coolers that do not conform to Intel specifications. We have been using Nepton 140XL liquid coolers for our reviews recently, and not only were the tubes from the pump blocked by the thermal armor (meaning we had to put the tubes next to the memory which pressed against one of the DIMMs), but because CM use a combined AMD/Intel backplate outside Intel specifications, the backplate required a lot of force (probably not advised) to get a fix. Other liquid cooler designs might work a lot better, but that Intel x-y specification is a stringent one especially on three sides of the socket. There are six fan headers on board, four within reach of the socket and another two on the bottom of the board. At the top of the board is also an assistant fan connector so users can attach the bundled fan. All the headers are controllable through the Thermal Radar software as part of AI Suite. 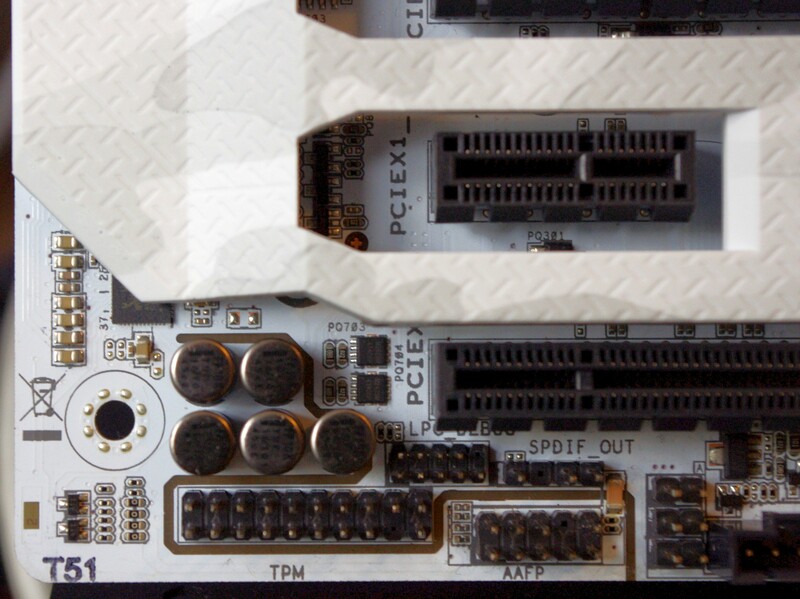 The DRAM slots to the right of the socket have latch mechanisms on the top only, meaning users should make sure that their memory is firmly in place. Normally around this area of the board we would see a lot of components dealing with data, power and signaling on the PCB, but the use of the Thermal Armor keeps the design tidy and aesthetically straightforward. The top right of the motherboard has ASUS’ MemOK button for DRAM boot failures along with one of the fan headers and the 24-pin ATX power connector. Beneath this is a USB 3.0 header (from the PCH), and the system SATA arrangement. Six SATA 6 Gbps ports are provided by the PCH, with ASUS also supporting one SATA Express drive. We are now several months on from the initial SATA Express glimmer making its way into motherboard demonstrations at Computex, but the lack of drives on the market is making me wonder about the long-term prospects of this technology. 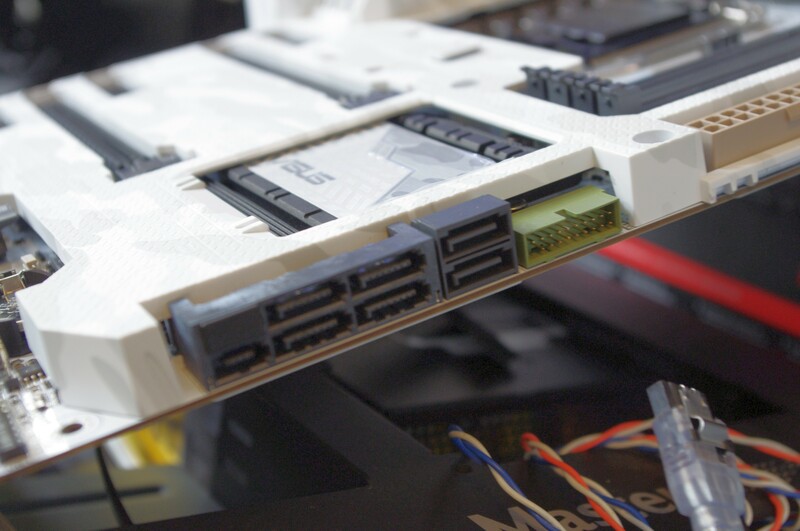 There are another two SATA 6 Gbps ports on the bottom of the motherboard powered by an ASMedia controller, and all of these ports have protectors bundled in the package. On the bottom of the board we get our front panel headers, two USB 2.0 headers, another USB 3.0 header (PCH), a TPM header near the rear audio and a Thunderbolt header. In the bottom right corner with the audio, the Realtek ALC1150 codec is just popping out from the Thermal Armor, but inside the PCB separation is used for better audio signal. Unlike some of ASUS’ other audio implementations, this does not feature an EM shield but does use filter caps. Nevertheless, our audio benchmark results were rather good. Unfortunately we do not get power/reset buttons here for quick testing. The rear input/output panel, like other TUF boards with Thermal Armor, leaves a gap between some of the ports for airflow. As mentioned above, the system as it comes does not have the small fan installed and users will have to do it manually if they want it. Aside from the fan we get four USB 2.0 ports, a BIOS Flashback button, DisplayPort and HDMI, two USB 3.0 ports from the PCH, two USB 3.0 ports from an ASMedia controller, an Intel I218-V NIC, a Realtek 8111GR NIC and a set of audio jacks. In keeping with the white theme, the rear shield is also white with a TUF logo. 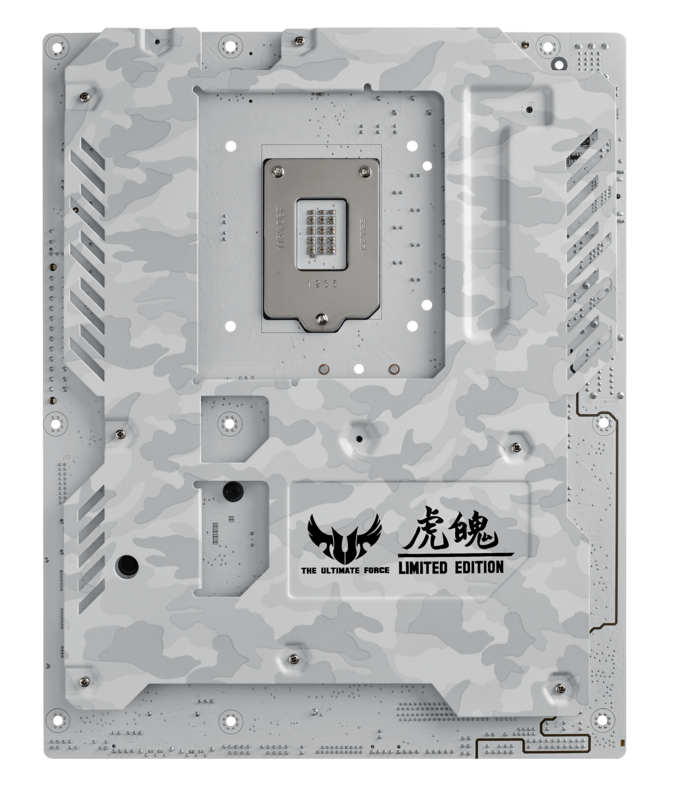 The rear of the motherboard is also in white, with the Thermal Armor sporting a TUF and Limited Edition logo. This makes me wonder if this would be more ideal for a system that could show off the front and the back of the PC. This is a challenge to any chassis manufacturers that might be reading! Part of the cost of the board will be for the Thermal Armor, then some more for the TUF rated components, and then there might be an additional cost due to the special addition nature of the model. At this point in time we have not been told the final cost for the US version, but we expect it to be around the $260-$300 mark. Never fear, the plastic doesn't actually cover anything hot. It serves basically no purpose past dust protection and looking pretty, but it shouldn't cause any overheating. Actually, it still seems like a bad design especially if it's for dust protection. They put an UNFILTERED intake fan on the rear of the computer (right next to the exhaust fans, mind you) and pipe it underneath the plastic cover. If anything, you're going to inject dust up underneath the cover that's supposed to prevent dust.